For those of you who don’t like tofu, I want to make a case for it. If you are already sold on tofu, skip to paragraph 2 below. Saying that tofu has no flavor is like saying an uncooked chicken breast tastes gross. I’ve never had one, but I’m assuming you have to season and cook a piece of chicken for it to taste good. Tofu is no different. It picks up the flavor of just about anything you mix it with or coat it with and the texture is suitable for pan frying, deep frying, steaming, sauteing and so on and on. I use it a lot in our dinners because sometimes just a bowl of pasta or just stir fried veggies isn’t enough. I need a little extra oomph to chew on, to fill my belly up, to get a protein fix. You can use it like you would use ground beef in chili. You can substitute it for paneer, Indian farmer’s cheese, or potatoes for a healthier alternative. You can crumble it up and substitute it for scrambled eggs. The possibilities are quite endless. These tofu medallions are a mix of crumbled, chunky tofu and pureed creamy tofu, peppery arugula, bread crumbs, garlic, Italian seasoning and nutty garlic rounded off with a sprinkle of red pepper for a little kick. I love nothing more than slurping up a big bowl of saucy spaghetti. But adding a few tofu medallions on top gives a nice crunchy/chewy addition that’s light on the waistline and provides you with some needed protein. A teaspoon of lemon zest, chopped parsley, diced green chilis, sesame seeds or a sprinkle of parmesan cheese would be great additions to these tofu medallions. Avoid anything that will let off liquid, like chopped tomatoes (unless maybe if you deseed them), because it might create problems when you pan fry the medallions. Medallions would also be great over a salad or rice. 1. Squeeze the block of tofu to remove excess water. See below for tips on doing this. 2. Take three fourths of the block and crumble it in a mixing bowl with your hands. Add the baby arugula, breadcrumbs, Italian seasoning, salt and chili flakes. 3. Saute the garlic until translucent then add to the mixing bowl. 4. Puree the remaining one fourth of the tofu in a food processor until creamy. Add it to the mixing bowl with the other ingredients and use your hands to mix the ingredients together. 5. Taste a little pinch and adjust as needed for salt and spice. Allow to rest for about 5 minutes if you have time. 6. Scoop up enough of the mixture to fit into the palm of your hand and shape it into a ball then pat into a flat patty about one fourth an inch thick. Place on a flat, dry surface and repeat until all of the mixture is used. 7. Heat a flat, wide skillet on medium heat and coat the pan with olive oil. Place the medallions into the pan (don’t crowd the pan) and cook on each side for about 4-5 minutes until golden. GENTLY flip with a wide spatula (using a fork with your other hand makes it easier) and cook the other side. *An easy way to make plain breadcrumbs at home is to take a slice of bread and bake it on low heat (around 250 degrees) until crunchy. Break the slice into small pieces and then food process until crumbled. 1 – The Long Method: Place the block of tofu on a plate with another plate on top it and a heavy-ish object (like a sugar bowl). Don’t weigh it down too much because you don’t the tofu to crumble. Leave it to drain and periodically dump the water. After about 30 minutes or so, place the tofu between two paper towels and gently squeeze out any remaining water. 2 – The Quick Method: Wrap the block of tofu in two paper towels. Holding it over the sink, gently squeeze with both hands until all of the water comes out. i am not a vegetarian, but i adore tofu. love your idea of making kebabs out of tofu. 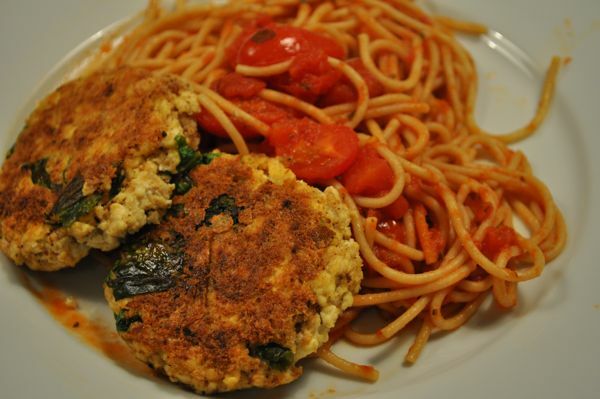 Tofu patties- what a GREAT idea! Sounds lovely! Another quick way to remove water from tofu – Microwave the entire block of tofu for about 3 minutes on high. Drain water and repeat if necessary. ND: Thanks…I’ve never tried draining tofu this way – will have to give it a shot. Oh yum, i’m always looking for new ways to use tofu. Thank you for sharing! 🙂 Love your defense of tofu, and that analogy to uncooked chicken breast. You are so right. These sound good (I especially like the inclusion of greens). I wonder if they could be baked instead of being cooked on the stovetop? i finally made these yesterday! i love them – such a yummy and healthy addition to pasta. a gave it two thumbs up too :). Thanks! I’m glad you guys enjoyed them and as always, love the feedback. I made these tonight and they were fabulous! Loved it and love your blog! @Manasi – Thanks for the comment and the feedback. I’m so glad that you liked them…Hope you guys are doing well! I made it today and it was just ok.Nothing to write home about. I found it to be rather oily and mushy hot. I like it better cold. Ta-dah! I am finally leaving a comment on your site! Admittedly, I am writing merely as an eater and not a cook. Lalitha made these Tofu Medallions for us yesterday, when we descended upon her last minute around dinner time. She prepped and served them in less than 30 minutes and they were awesome. I am inspired to make these myself now. Great idea!